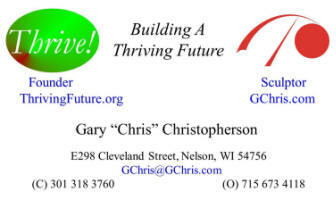 “Thrive!” is building & achieving a surviving & thriving future for all forever. #ThrivingFuture #Thrive #ThriveEndeavor! Contact - If interested in or want information on Thrive!, please fill out and submit Contact Form below or send email (Thrive@ThrivingFuture.org) or phone (301 318 3760).